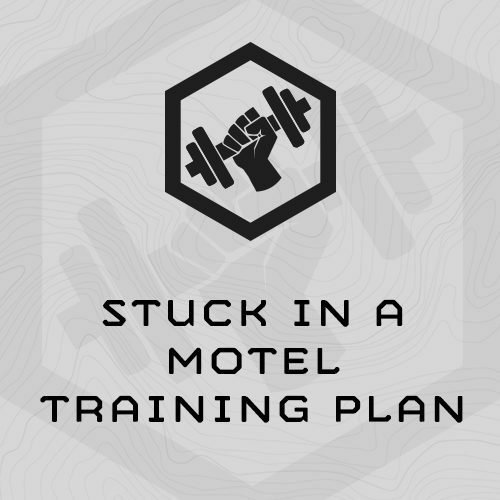 This 6-week, 36 session training plan is designed to train strength, work capacity, endurance and durability for athletes stuck in a motel for an extended duration. This program is designed around the equipment found in a typical business motel fitness room – a full set of dumbbells, flat bench and treadmill. shake out the cobwebs and recharge. So the plan is made up of 2-a-Days, Monday through Friday. Early AM Sessions are strength or work capacity/core focused, in the motel fitness room. These are short, focused sessions designed to last 45-60 minutes long. Afternoon PM sessions aim to get you outside for a short run, or some “Swim PT” in the motel pool. For inclement weather, you can either run on a treadmill or do step ups in the fitness room. The program also includes a long run on Saturdays, if you’re stuck in the motel over the weekend. AM training sessions in the motel fitness room will take 45-60 minutes. PM sessions outside last 20-45 minutes. Long weekend runs extend to 90 minutes. How long should I rest between Rounds and Circuits for the Strength Sessions? hard to do so, but ideally you’ll be able to get all the reps in. Load yourself accordingly. complete all the training sessions in succession. Whatever the schedule, always take one day a week, as total rest. What does “5x DB Hang Squat Clean @ 15/25#” mean”? “5x” is the number of Reps.
“DB” is short for Dumbbell. “Hang Squat Clean” is the exercise. Alternating Military Press, 1-Arm Row and Bench Press? done it several times in typical motel swimming pools.